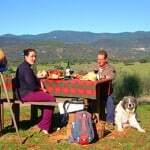 THEMED HOLIDAY IDEAS OFFERING YOU A GOURMET WALKING WEEK IN THE SIERRA DE HUELVA! Here at Molino Rio Alajar we invite you to join us on a pre-planned week (8 nights/7 days) that delivers the best the Sierra has to offer: walks through some of the most beautiful scenery in Spain, sampling some of the best local food and restaurants while having the chance to make some of the local delicacies yourself taught by local experts. We have carefully prepared an itinerary each day that takes into account some of our personal favourite walking and eating experiences gained from the last 20 years living in the area. The week is planned to start on a Saturday and you are free to join it at any point but the sequence of events is fixed across the week so you join the programme on the day of your choosing and must complete the full 7 night/8 day programme. Please let us know at the time of booking your chosen starting point. The programme is available from September 15th until 1st of June and, since we try and meet each person’s individual requirements, a breakdown of costs is detailed below based on your mode of transport and how you wish to pay. Back in Alajar you can participate in a cooking course which starts at 18.00 run by Concha an accomplished local chef. She will teach you how to make 3 typical local dishes which you eat at her place – an old bodega in the village. Cost of this event is 37.50 Euros per person. From the selection of detailed walking maps and directions provided on your arrival you can choose a circular walk from your cottage door. During the mushroom season you can pick your own under the direction of an English speaking guide. 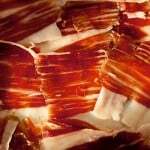 Lunch this day is at El Corcho located in the village square of Alajar some 1.5 km from your cottage. 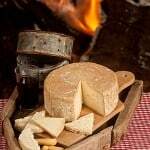 We have arranged a three-course meal with mushrooms and a bottle of wine at a fixed price of 35 Euros per person. Today, another favourite circular walk of 15 km right from your cottage doorstep. This one we call the Walk of the Watermills, which takes you on a path running alongside a river past abandoned watermills with glorious views and changing vegetation. At the halfway point we will arrange for a picnic table at the Hermitage of San Bartolome where you will be served a meal prepared by Felisa one of our colleagues. The price will be 25 Euros per person. San Bartolome is a favourite local gathering point because it offers such terrific views of the surrounding countryside. A 15 km circular walk on ancient donkey trails through cork and olive groves from Alajar to the picturesque village of Linares de la Sierra. Here at the halfway point you can have lunch in one of the areas best Michelin listed restaurants Los Arrieros (www.arrieros.net) Here you will be served a specially prepared five-course gourmet menu including drinks at a fixed price of 38 Euros per person. Afterwards you will have the chance to walk back to Alajar or take advantage of a taxi service back Molino Rio Alajar. Also on offer is the optional use of the Arab baths in Linares – Hamman Spa and Massage – which you can visit before your meal. An earlier start time will be needed to incorporate this in the day’s itinerary www.lamolinilla.com Cost of the treatments is not included for this optional facility. 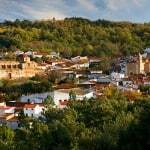 Following this we drive to Aracena where you will have a chance to explore this delightful town. There will be an opportunity to visit the famous local caves of Aracena – one of the top ten tourist sites of Spain. Locally they are known as the Caves of Wonders. They are open from 15.00 to 18.00 in the afternoon and the entrance fee is 8.50 Euros per person. 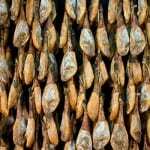 Also possible is a visit to the Aracena Ham Museum which tells the story of the regions most famous delicacy. Open from 11.00 to 13.45 and 15.30 to 18.00 the entrance fee is 3.50 per person and includes a tapa. In the evening in Aracena we have reserved a table at one of the best restaurants in town, the Restaurante Montecruz, where a specially prepared 3 course meal will be served.The cost is 35 Euros per person and includes wine. After dinner a taxi will take you back to Molino Rio Alajar. You can choose from one of two walks of 8 or 12 km to the village of Castano de Robledo, named after the local chestnut trees. The route is through beautiful chestnut forests with far reaching views along the way. At 18.00 there is an opportunity to make your own pastry cakes under the tutelage of Teo in the delicatessen shop El Monumento in Castano del Robledo. Teo’s speciality is chestnuts in chocolate. The cost for the two-hour lesson is 20 Euros per person. 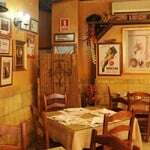 After the class you go to the main square of Castano del Robledo where you will find the restaurant Maricastana located in a beautiful old village house. There Anton, the chef and owner, will serve a specially prepared 3 course meal. The cost is 35 Euros per person including wine. After the meal a taxi will bring you back to Molino Rio Alajar. Today you undertake one of our favourite walks – The Gorge Walk. – 17 km from the door of your cottage. The walk takes in an extraordinary range of scenery within a relatively short distance, capturing all the beauty of the Sierra. Cork oak forests, ravine, meadows and meandering river. At 21.00 at the restaurant El Padrino in Alajar we have organised a wine-tasting session in the restaurant’s ancient wine cellar which has an interesting collection of old farm implements going back many years. After the wine-tasting and tapas you can enjoy a three-course meal in the old chapel part of the restaurant for 35 Euros a head including a bottle of wine to celebrate the last night of your trip. NB – While it is possible to join this programme at any time during the week the events each day remain fixed so you will experience the week in a sequence based on your day of arrival. 2) If you wish we can provide an oven meal with starter and dessert so you can prepare your own evening meal and relax in your cottage. Cost 20 Euros per person. 3) You can book a very experienced multi-lingual local walking guide to get the most out of your walking experience. Peter has a great deal of knowledge of the local flora and fauna in this the largest natural park in Andalucia which will enrich your holiday in the area. It would be worthwhile booking him for an introductory 4 hour session on day 1 – 60 Euros for the morning. You have your own transport and will pay each supplier individually after each activity. Euro 565 per person. This allows you the freedom to skip some of the events or restaurant meals should you choose to make alternative arrangements. You have your own transport but we will take care of payment to each supplier. Euro 905 per person. Monday to Saturday. Seville to Alajar every day at 9.00 and 16.00 (journey time approx 2 hours). Alajar to Seville daily 7.00 and 16.00. Sunday. Aracena to Seville 11.00 and 17.15.